On April 19 my friend Djurdja and I went to the Barbican for a concert by the New York Philharmonic. 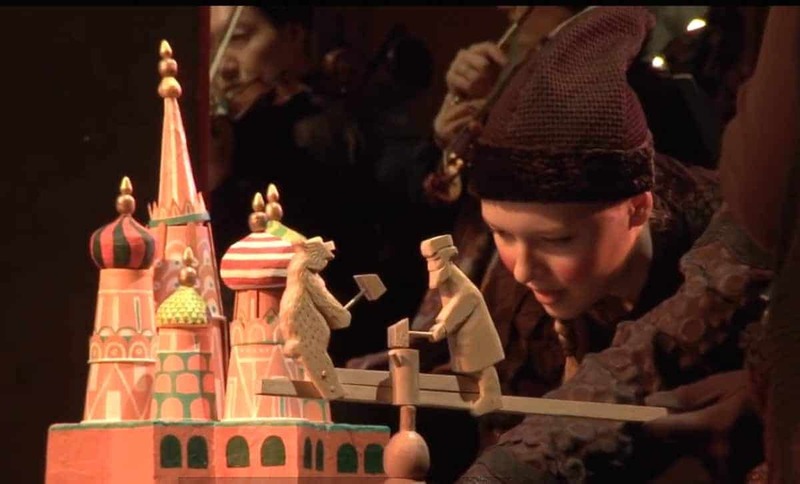 It included a performance of Stravinsky’s ‘Petrushka’. It’s hard to describe how extraordinary and exciting it was – so I hope the following pictures, reviews and clips will help to give a flavour of it. 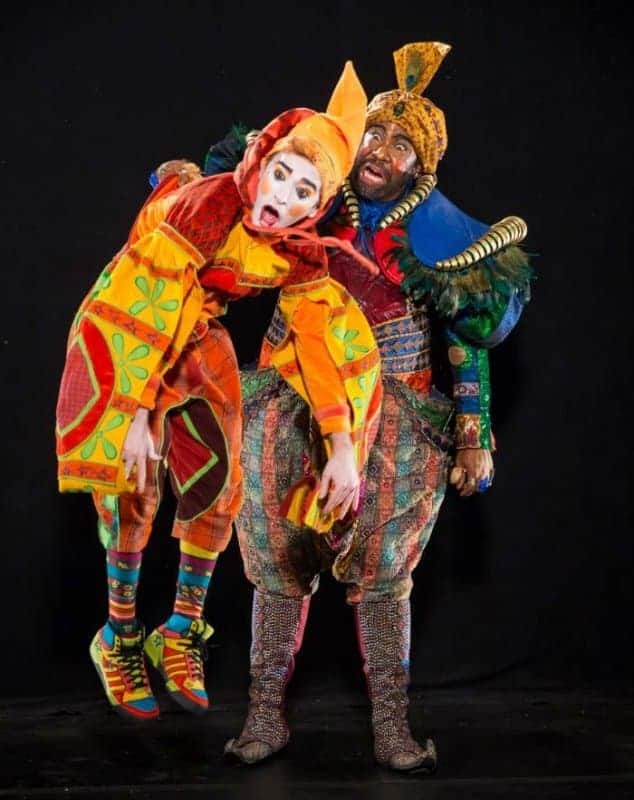 ‘Focusing on early-20th-century works and notably avoiding the symphonic repertory, the New York Philharmonic’s London residency came to a close with Stravinsky’s ballet Petrushka, in a multimedia production by Doug Fitch and his company Giants Are Small. 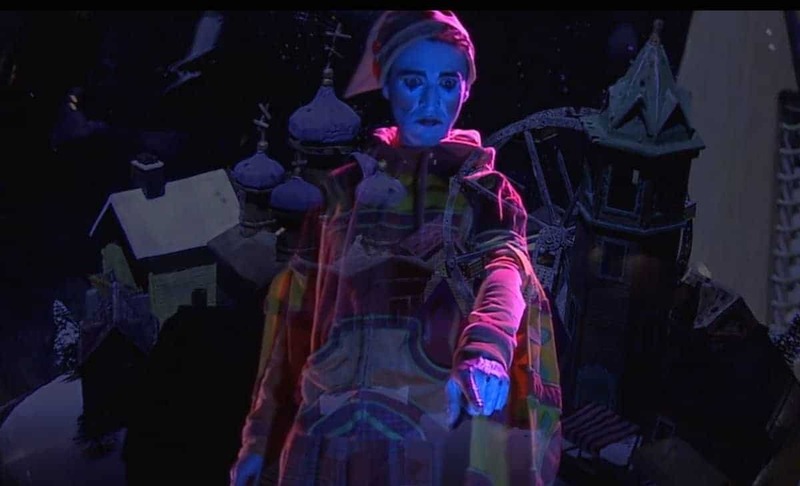 “Genre-bending” is how Fitch describes his work, which amalgamates puppetry with dance, video, live action and audience participation, all of it projected on a vast screen suspended over the players’ heads. The aim is to break down the formalities that govern the average concert and redefine the relationships between musicians and audiences. 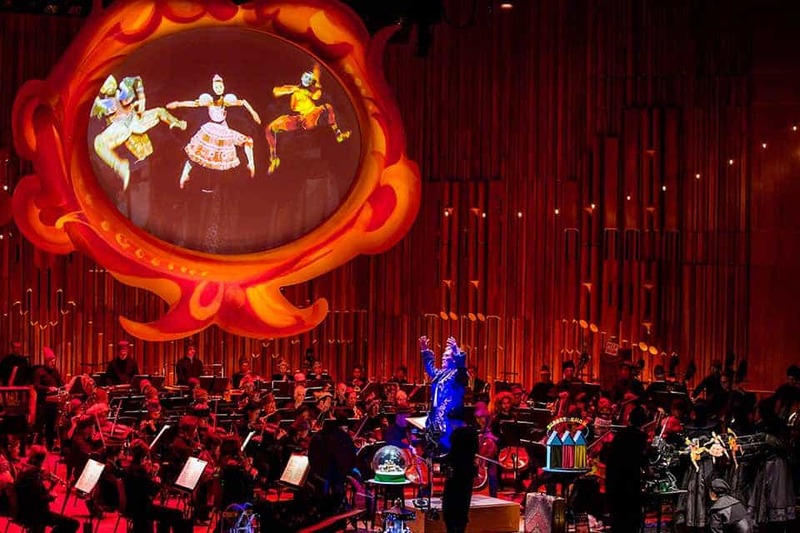 The screen at the Barbican wasn’t nearly as big as in this picture (from the New York performance). 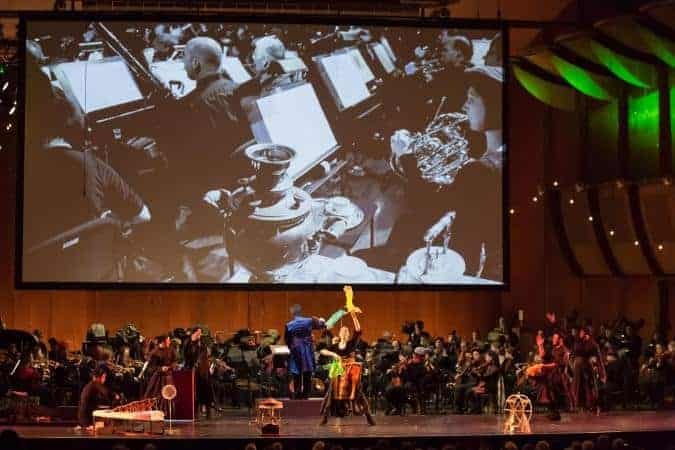 A smaller screen was better, I think, as it must have made the impact of the orchestra more prominent. This is the screen at the Barbican performance. I don’t agree with the Guardian’s reviewer that everything going on on the stage and on the screen suspended above the orchestra detracted from our awareness and appreciation of the music. At the beginning I thought that would surely be the case, but the clarity and vibrancy of the sound throughout was what struck me above all else. 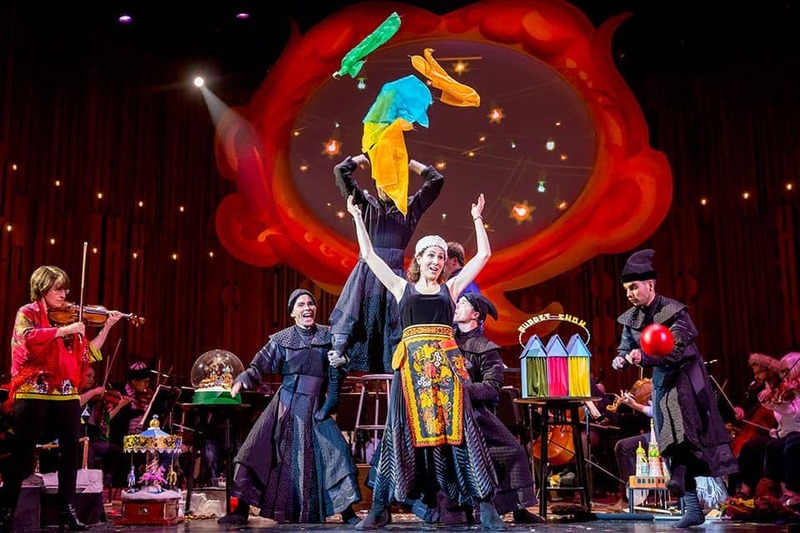 And this was helped by being able to see all the members of the orchestra so involved, which wouldn’t happen if you were watching the ballet ‘Petrushka’, when your attention would surely be taken up more by the dancing than by the music. 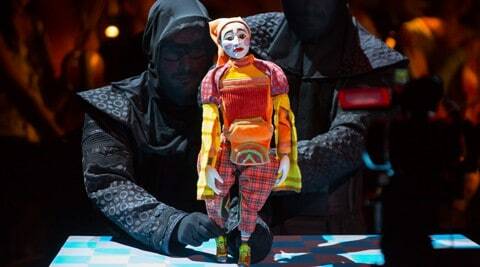 Giants are Small: how we brought Petrushka to life. Have a look – and a listen – to this extended clip from the performance given in New York (we didn’t have the two ‘live’ ballet dancers on stage in London). And this one about the development of the production. How I wish I could have seen and heard this!! But thank you for giving a very vivid taste – in words and pictures – of what must have been an extraordinary experience.